Munster head coach Johann van Graan has made four changes to his pack for Saturday’s Heineken European Champions Cup clash with Gloucester at Thomond Park (kick-off 1pm). Following on from last week’s gritty 10-10 draw away at the Exeter Chiefs in their opening assignment of the competition, Van Graan has shaken things up in the forwards. An all-new front row has been named with James Cronin, Rhys Marshall and John Ryan coming into the side in place of Dave Kilcoyne, Niall Scannell and Stephen Archer. The second row pairing of Jean Kleyn and Tadhg Beirne is unchanged. The final change to the team sees Tommy O’Donnell join captain Peter O’Mahony and CJ Stander in the back row with Chris Cloete missing out. The backline remains the same with a back three of Mike Haley, Andrew Conway and Darren Sweetnam. Rory Scannell and Dan Goggin form the centre partnership with Duncan Williams and Joey Carbery in the half-backs. Kevin O’Byrne, Arno Botha and Alby Mathewson join the replacements with Mathewson returning from a knee injury sustained against Leinster earlier this month. Follow Munster v Gloucester via our live blog on RTÉ.ie/sport and the News Now app. Listen to live and exclusive radio commentary of Racing 92 v Ulster on RTÉ Radio 1's Saturday Sport. 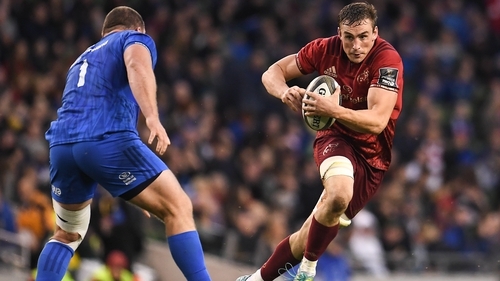 Follow Toulouse v Leinster via our live blog on RTÉ.ie/sport and the News Now app or listen to live and exclusive national radio commentary on RTÉ Radio 1's Sunday Sport.